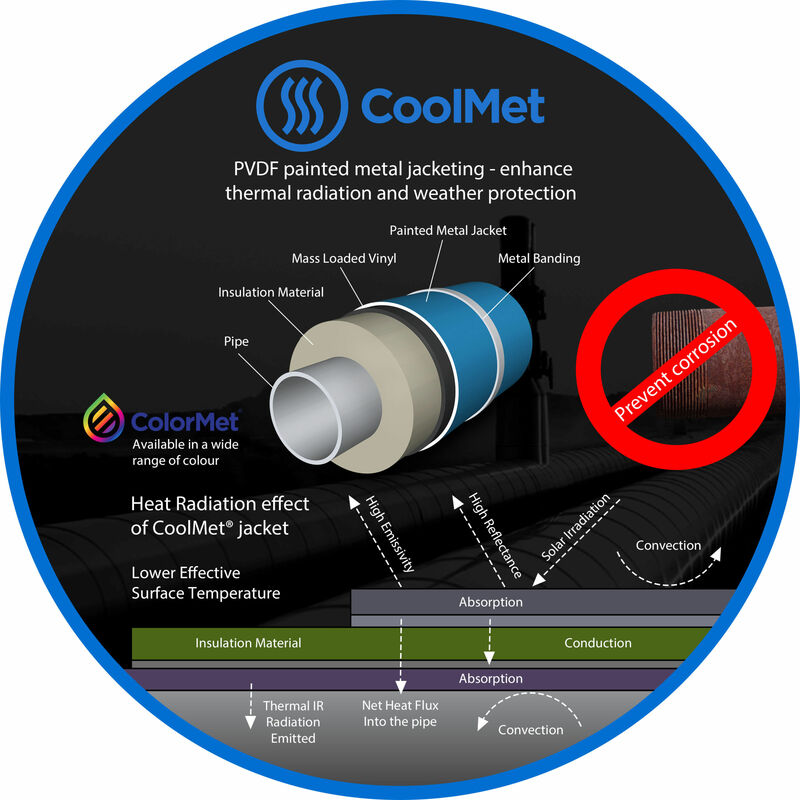 CoolMet is another BS Stainless trademark, it is a painted insulation jacket on the top side with a high emissivity and high reflectance PVDF Paint. CoolMet uses a PVDF paint, which is one the most stable paint systems known to man. Also, we have used an innovative application method to enhance the paint emissivity along with the reflectance. The combination radiates maximum heat away resulting a low effective surface temperature. Reduction in Insulation thickness leading to reduced insulation costs. BS Stainless is currently offering this product supplied in coil or sheet manufactured to order in a range off thicknesses and in grades 304 (1.4301) and 316 (1.4404) stainless steel. Test show a significant increase in corrosion resistance compared to bare stainless steel, where extended life expectancy is needed Coolmet can offer the solution. Coolmet can be combined with Drymet which is a factory applied moisture barrier, the moisture barrier combines layers of Poly and Surlyn ® to form a protective internal barrier thus preventing corrosion on the inside more information on Drymet. 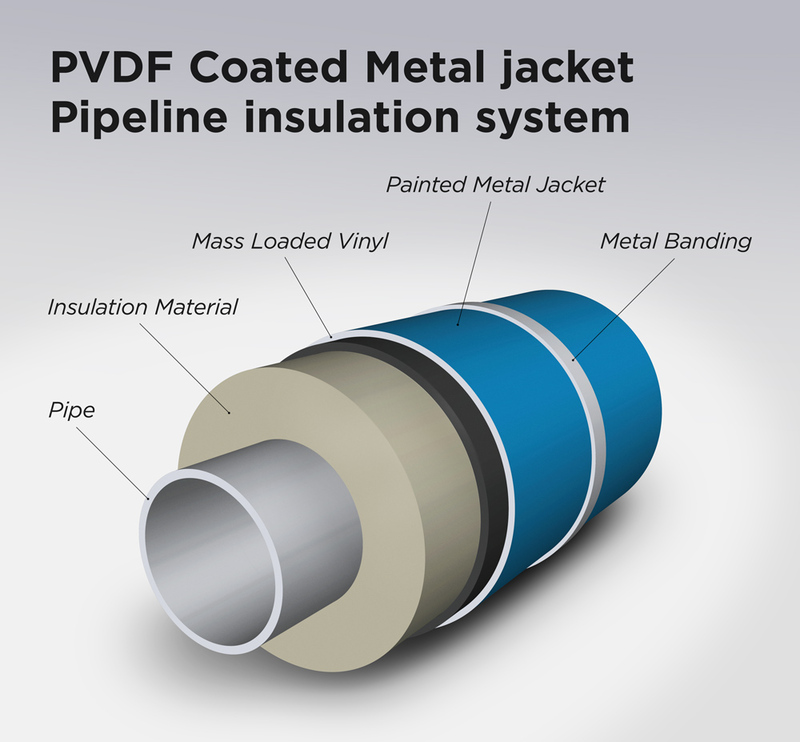 The PVDF paint outer coating on stainless steel is now the first choice for LNG plants worldwide. Used on major projects such as Ichthys, Woodside, Gorgon, Yamal and many more its able to stand up to a wide range of temperatures, extreme conditions and out last many other systems. The key advantages of BS Stainless PVDF (DryMet) is its readily available from production meaning fast delivery’s worldwide. Developed and performance tested with Sheffield Hallam's materials engineering research institute (MERI) to meet and exceed insulation specifi­cations form EPC's and FEED companies producing all the primary projects specifi­cations. Can be combined with other innovative products manufactured by BS stainless from coatings such as moisture barrier, sound barrier or a full range of ancillary’s including banding, springs and fixings. There are many brand names and technical descriptions within project specifi­cations CoolMet will meet the technical details of descriptions such as PVDF, PVF2,­Colorsoftain or by paint brands such as Kynar. We can supply full data sheets, technical support, samples and test data when required. *For more details on CoolMet® and to request samples of this or any of our metal jacketing systems, please contact our engineers.